To MC or not MC? In today’s World of conference’s and events, deciding not to engage a professional M.C. can be detrimental to a successful outcome. If this sounds a little melodramatic, picture this – The conference has begun, the first speaker is speaking and you are then advised your second speaker is running 30 minutes late. What do you do? A good professional Master of Ceremonies (MC) will be able to fill this spot until the speaker arrives. Could the in-house MC do this? 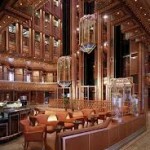 Gone are the days when the company Managing Director hosted the Awards dinner or conference. Clients today spend literally tens of thousands or even hundreds of thousands of dollars on all aspects of conferencing and events, and it is imperative that goals are kicked in every area. MC’s today are not a luxury but a must for all conferences and events looking to impress delegates. So you have never booked a professional MC before? Why change! So what does an MC really offer? Keep the audience engaged – Using a variety of techniques, a professional MC will ensure the audience is engaged in the program (usually ensuring they are having fun). They’ll also give the conference or event focus and they can vary the energy flow over the event. Make the event meaningful – A professional MC will be able to draw links within the program, bring issues to life and can create a real learning atmosphere. Maximise outcomes and investment – Conferences and events cost money, lots of money, so it is important that the outcomes are met and there is return on the investment. A good MC will assist this process. 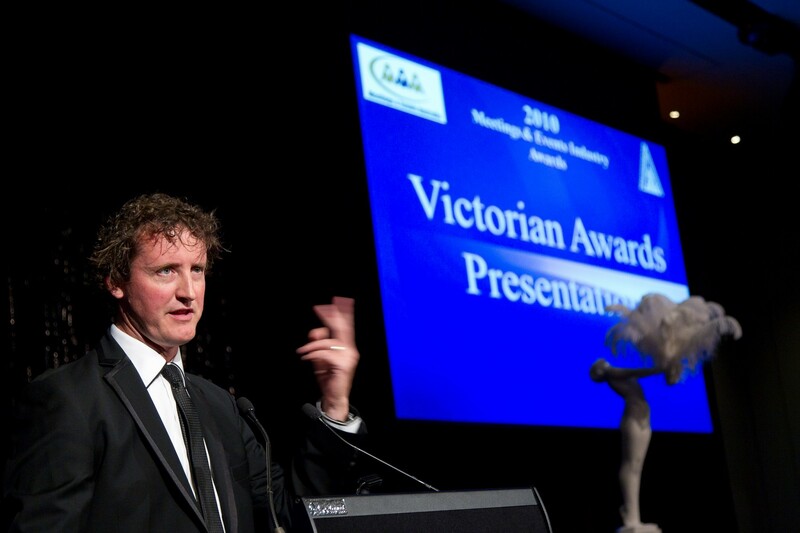 Provide knowledge and experience – Finally a professional MC can assist organisers in creating a productive program or event which meets client expectations. An MC with experience will know what works. What should you look for when booking a professional MC? Be able to demonstrate a great array of experience. If you are running a 3 day conference, has the M.C. been involved in one or more of these before and if so, what did their client say. Why not ask to speak with the client? Demonstrate a clear understanding of what your objectives for the event are. Most importantly take the headache away from you and provide a sense of security knowing that whatever happens on the day, the M.C. will be experienced enough to deal with it. How do M.C.’s add value to your event? Brett added that “most importantly, an MC can be Independent, that is, they can say things and at times challenge the audience when an in-house person could not”. It’s all very well to hear from MC’s, but what does a client say? Suzanne Hart, Director of Suzanne Hart Events said, “Any professional conference that wants to run smoothly and on time needs to engage a professional MC…The very good MC’s are great at ensuring the program moves along, they’re able to think on their feet and deal with unexpected situations. Finally they’re critical in linking the key elements of the program together. A consistent face at a three day conference can add enormous amount of value”. Suzanne did point out however that it is very important for the organiser to provide a detailed brief for the MC. 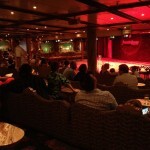 I’ve been having a ball working as a featured comedian on the Carnival Spirit in the last few weeks. 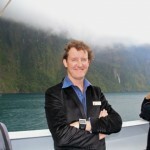 Trips to Noumea, Vanuatu and most recently New Zealand. The best part about heading to the ‘land of the long white cloud’ was that it was the first time for most of the international crew onboard. 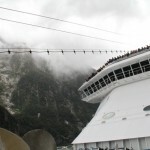 They poured onto the crew only front deck of the huge ship as we entered Milford Sound. Luckily the weather cleared in time for us to take some great pics. 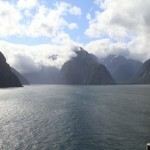 My last trip was Christchurch to Sydney arriving at Circular Quay. By a stroke of good fortune one of my favourite corporate clients called asking me to MC her corporate awards night at the Sydney Opera House. As luck would have it the dates aligned and I stepped off the ship, into a hotel alongside the ship and then I walked to the venue. Perfect! It was a sensational night which ended with a rockin’ set from Mahalia Barnes and Prinnie Stevens. 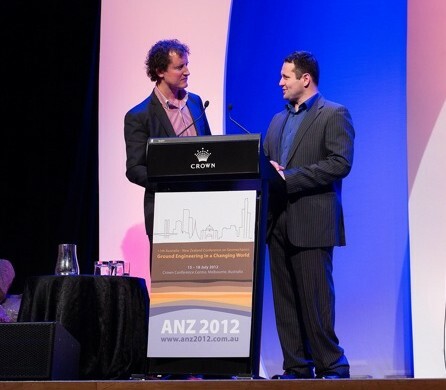 Finally, I have just returned from MCing the AIME conference ‘Hosted Buyers Breakfast’ for my 3rd year in a row. My job was to write a little comedy spot, warm up the 300+ international guests and introduce the various speakers. The most fun happens at the end when I have to send the audience off into small groups. This year I created a novel way of sending them off. Rather than just calling out their tour numbers I played a song to the whole room. They then had to identify the number referenced in the song before leaving if was theirs. Songs included ‘One’, ‘Four to the Floor’ and ‘Knock Three Times’. They really enjoyed the challenge as some songs were way harder to pick than others. 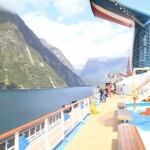 The famous Carnival Spirit waterside. I love the Carnival stack. Just before the weather cleared. A beautiful day in NZ! I’m lost against this HUGE wall! I don’t know what it is but a crowd on holidays on a ship is something really special. They’re not necessarily comedy experts but they just love to laugh and so make a really honest, committed crowd. Not to mention a large crowd. I tried to count the Versailles Lounge capacity and got lost around 350ish. The mad rush to get in the lounge helps with the sense of anticipation. Especially when there’s up to 1500 upstairs in the main theatre with only a small percentage of the most athletic getting in to my show. My last cruise from Vanuatu to Sydney had a great group of passengers including lots of large groups; 50 from Sydney, 14 from Adelaide and a whole bunch from QLD. These guys were in great spirits considering many of them didn’t know what they were to find on returning home after the floods. 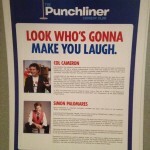 I had some ripper shows in the Punchliners Comedy Club, especially my late adult shows. Thanks to the crew and my fellow performers Hung Le (see below) and Ben Murphy. Great Fellas! 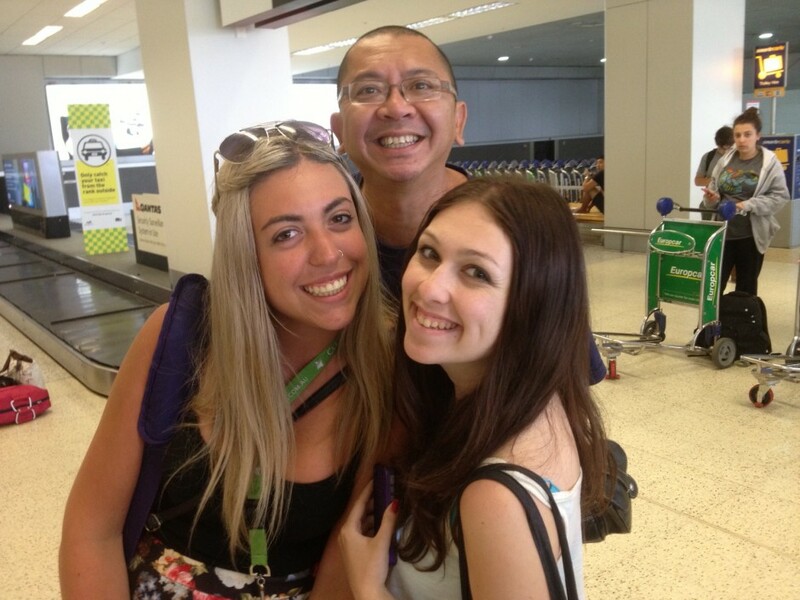 Hung Le at Melb Airport with 2 lovely girls off the ship! It’s been a much busier January than I’m used to. Generally the city slows down and so do I but this year I’ve been on the ship to Noumea then back for some gigs and I’m off again near the end of the month. 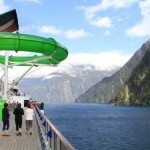 Feb will be much the same with the Carnival Spirit heading on a new route to New Zealand. The international crew are very excited with many counting the days. 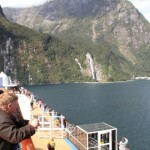 I filled a few of them in on Milford Sound and they can’t wait. Actually either can I. Last time I was there was 3 years ago with my brother. We drove for ages only to find it totally fogged in. We snapped a pic of a post card and framed it so it looked real. 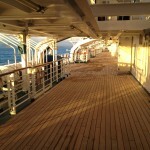 I can’t wait to be in the middle of it on a 300m long ship! 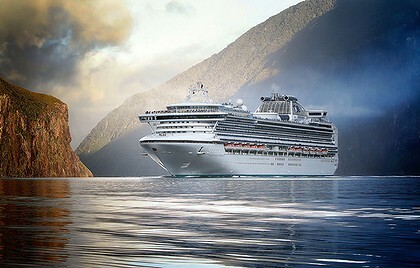 This is the Sapphire Princess not the Carnival Spirit but you get the idea. Imagine working all day in the galley and missing this view outside. Lucky our stand up shows are at night! Ahh go comedy! 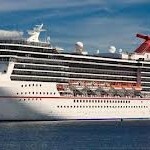 So I’ve been working on this ship, the Carnival Spirit. It’s huge! 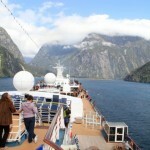 Over 2500 passengers and nearly 1000 crew and staff. 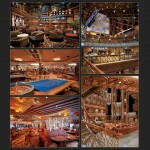 I was one of the 2 featured comedians on the ship. The other was my mate Simon Palomares. The shows took place in the Versailles room which is a beautiful room that sits about 300 and turns into the Punchliners Comedy Club at night. I had a great time performing 2 children/family shows and 3 adult shows. Awesome shows and crowd. Looks like I’m back again in January. I’ll know more soon. 3500 passengers and you wouldn’t know. 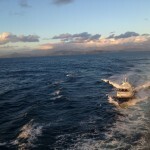 The pilot boat guides us out of Noumea. 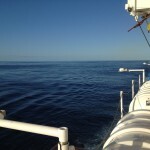 A beautiful day at sea. My audience starts to shuffle in to the Versailles room on the Carnival Spirit. It’s been a great couple of weeks with an interview on Foxtel, a staff function for staff at Crown Casino, the Grand Final Parade (damn you Sydney – I’m a Hawks man), multiple large events for Coles, Inventium workshop, a couple of days away to beautiful Echuca for Mawson’s concrete and finally the Australian Institute of Business Brokers 2012 conference. I’m at the conference writing this now between sessions. Last night was the Gala dinner where I was the entertainment for the night. It was a great night held at the MCG. Despite a challenging room layout it went really well. I’ll post some footage on my site soon. My first TEDx experience was fantastic. It was hard work with lots of intros needing editing and plenty of background research but it was all worth it. While I’m very used to the corporate MC style, I’m not used to working to a crowd most with their heads deep in their iPads tweeting anything of interest! A couple of my asides were tweeted immediately. Hilarious!! I really enjoyed the selection of speakers which included Shanaka Fernando from Lentil As Anything restaurants , Adam O’Donnell ex SAS member- now Leadership trainer and Helen Macdonald the corporate optimist. I enjoyed getting the crowd dancing for Joseph D’Souza’s arrival onto stage. Check out the pic! 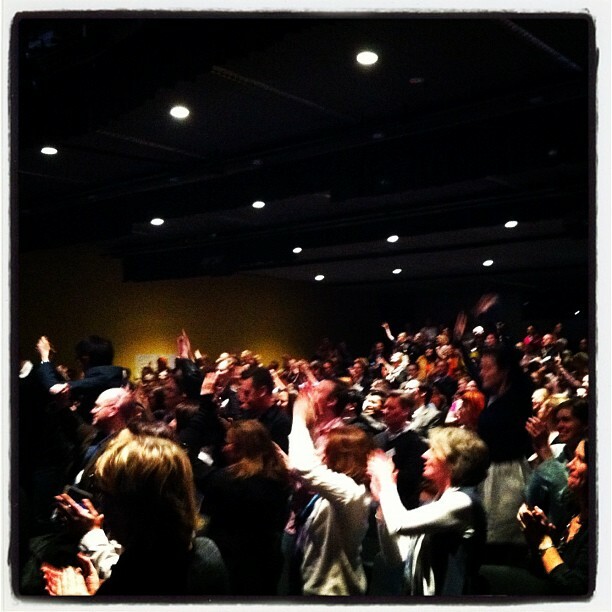 TEDx Melbourne Crowd goes off! It’s been a very busy month! I MC’d the Australia and New Zealand Geotech Conference at Crown Casino’s Palladium room for Leishman Associates and ICMI Speakers and Entertainers. The event was the Gala Dinner in a busy conference and adding some fun seemed to go down really well. Next was a great event for Bosch at one of my have hotels the Sebel Albert Park in Melbourne. Working with Wacky Entertainment we rocked the night with our special brand of live and interactive quiz. The music questions were all played live and the interactive table games went down a treat. I had the pleasure of co-writing the opening segment for the NICE Systems conference at the Langham Hotel. The brief was to create a funny, engaging and interactive opener for an 8:30am start! We also needed to fit in with the Mafia/WiseGuys theme. We did it, got the laughs and then I stayed to MC the rest of the conference. Lots of keynote presentations to weave in and out of and many moments of energy were required to keep the day motoring along. Thanks to Jon Smith from DG Global. I flew to Sydney for one of my favourite clients – Perpetual. Their Private Wealth Awards took place at the Wentworth Sofitel recognising their top performers. My role once again was to make the prestigious night fun. I linked the night’s theme of excellence through great achievement to the London Olympics and played a hilarious short DVD that I edited and followed later with some stand up comedy. I also had some fun with the award winners as they came to the stage. Special thanks to Nancy at Saxton Speakers. 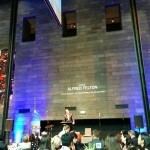 Next I flew back to Sydney to MC the stage at the Sydney Event Showcase (prev RSVP). This was a huge event bringing together some of the top event related people in the land. My stage duties involved warming up the crowd ahead of performances which included legendary Aussie/NZ band Dragon. Thanks to Harris, Kate and the team from Apples & Pears Entertainment. 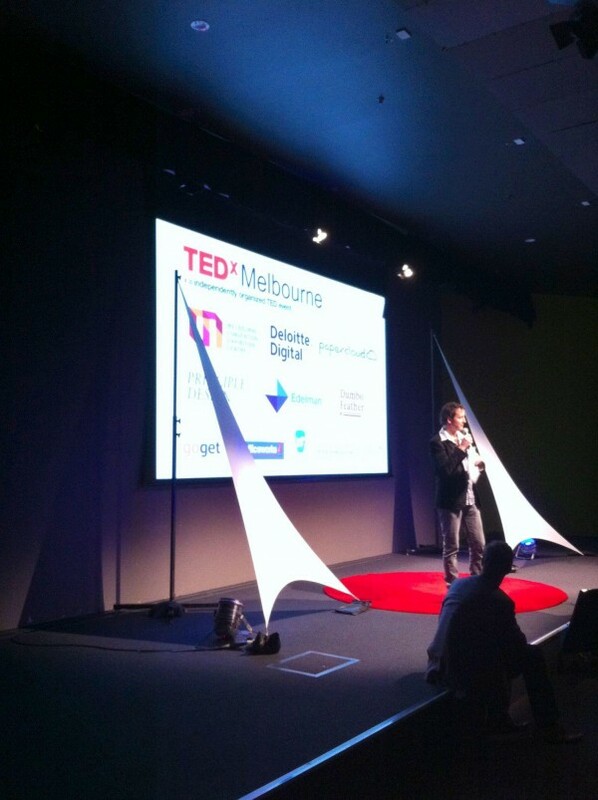 Coming up this week, I am MCing my first TED event here in Melbourne. Can’t wait!